In perpendicular lines when two intersecting lines a and b are said to be perpendicular to each other if one of the angles formed by them is a right angle. If two lines meet or intersect at a point to form a right angle, they are called perpendicular lines. We can draw a perpendicular line with the help of a set of square. The symbol used for perpendicular lines are ┴. For example, a ┴ b (read as a is perpendicular to b). In the above figure, AB and AC are perpendicular lines. ∠CAB = 90°. We use the symbol ⊥ to represent perpendicular lines. What are perpendicular lines in geometry? Lines that meet or cross at right angle are perpendicular to one another. 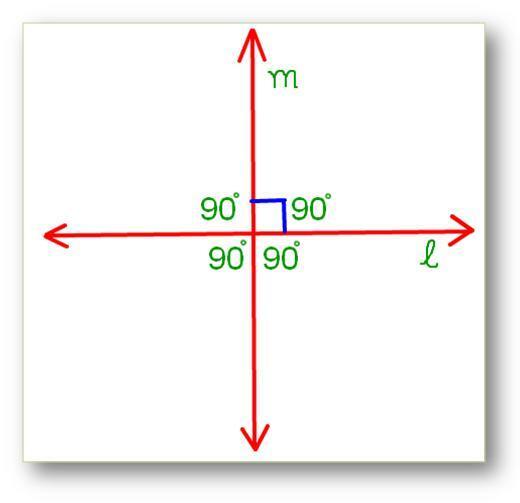 A right angle is usually marked by a box as shown in the above figure. Two rays or two line segments are said to be perpendicular if the corresponding lines determined by them are perpendicular. Similarly a ray and a segment are said to be perpendicular if the corresponding lines determined by them are perpendicular. Here, l ┴ m (read as l is perpendicular to m).